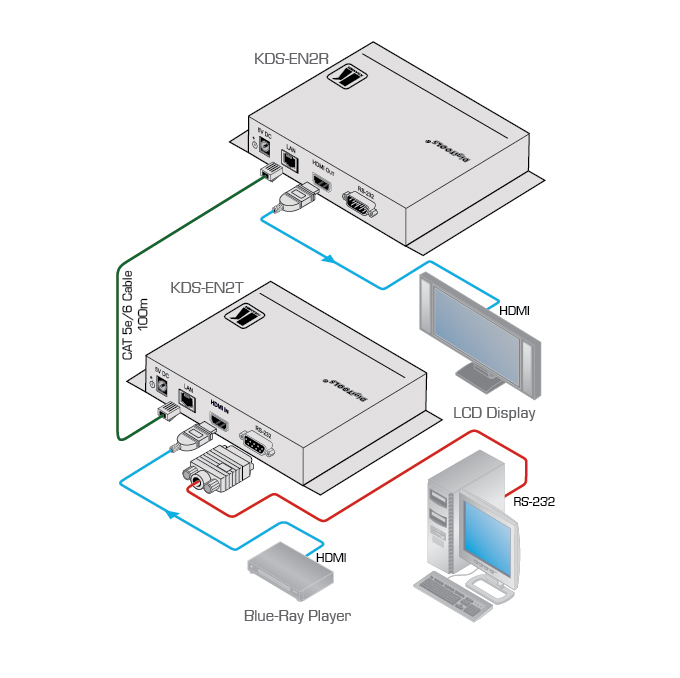 The KDS-EN2T is an IP-based transmitter for HDMI signals. Using JPEG2000 compression technology, the KDS-EN2T sends a visually lossless HD image with digital stereo over a 1000BaseT LAN to a KDS-EN2R receiver for multicasting, video wall and digital signage applications. High Flexibility - Flexible and scalable HDMI 1080p for video broadcasting with Gigabit Ethernet LAN. High Scalability - Up to 9 transmitters and more than 81 receivers possible in a video wall system, as well as over 200 receivers from each transmitter in multicasting mode. Multicasting and Broadcasting Architecture - Each channel requires about 55Mbps. Cost Efficient Infrastructure - Transmits an HDMI signal over one CAT5e/6/7 cable. Controls - Group ID can be defined either via the built-in DIP-switches or by using the remote utility. RS-232 Pass-Thru - Controls the HDMI display from the transmitter side. Compact DigiTOOLS� - With a built-in mounting plate for versatile installation. Outputs 1 LAN on an RJ-45 connector.